Your bike is making you deaf. That is, of course, if you don’t wear any form of hearing protection while riding. Just an hour on your bike at motorway speeds is enough time to cause hearing damage. It’s wind noise, rather than engine noise that is the main issue as the energy in the sound waves gives your tympanic membrane a hammering. Yes, helmet technology has improved and lids are generally quieter and yes, a big screen will reduce noise but hearing loss is still an issue and here to stay. If you’ve ever got off your bike and your ears are ringing, that’s called temporary threshold shift and it’s an early sign that you’re damaging your hearing. Lying in bed at night and your ears are ringing? That’s an early stage of tinnitus. It’s time to review your ear plug protocol. Studies show that hearing damage can have a significant effect on a person’s mental and emotional well-being, often leading to feelings of anxiety, frustration, and depression. That all sounds a bit deep but hearing loss is a serious issue and if you ride a motorcycle you’re at a much greater risk of doing irreparable damage to your ears and you’d benefit from sticking something down your lughole before you ride. Aside from saving your hearing, earplugs have two other benefits – firstly, when you first put them in, it’s like someone’s added 50bhp to your bike – the lack of noise has a funny way of making things feel faster. Secondly, wearing earplugs over a long distance helps prevent you from feeling TOTALLY KNACKERED when you get there. The battering the wind noise makes is overpowering for the old noggin. This review covers three main types of earplugs for motorcyclists: custom moulded, reusable and disposable. Custom moulded earplugs are a popular item for motorcyclists who are already converts to the quieter side of motorcycling. They come in two types: DIY custom moulded earplug kits or custom earplugs that are professionally produced. They are exactly as they sound – earplugs that are bespoke to you. They usually cover the entire outer of your ear (known as the concha). The plug itself doesn’t go that far into your ear canal. 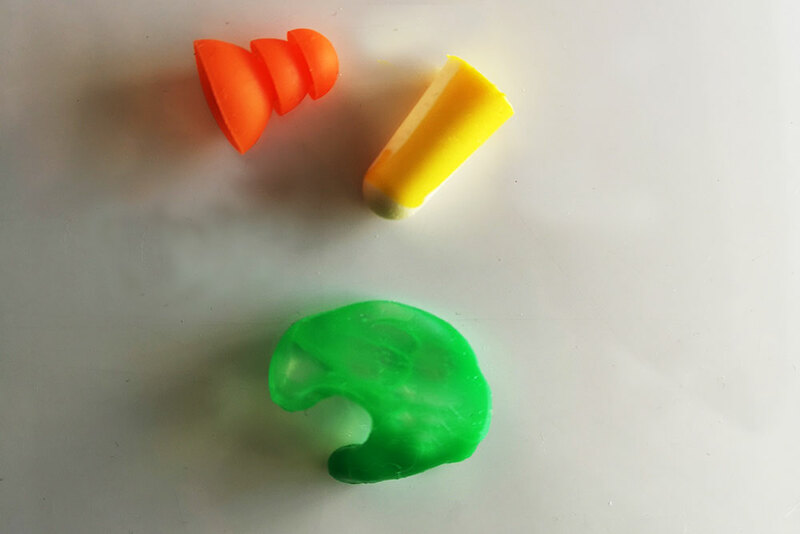 In my experience (I’ve had two different types of custom moulded earplugs), they don’t block out as much sound as a disposable foam earplug but if you find any earplugs uncomfortable (due to pressure in your ear canal), a custom set might work well for you. They’re easy to maintain as most can just be washed with soapy water. Some companies will also produce versions that come with earphones built in, connected to a 3.5mm jack. A DIY custom moulded earplug kit will cost around £30. For a set of custom moulded motorcycle earplugs, the cost varies but expect to pay anything from £60 – £100 for a quality set. If you’re going down the custom route, we’d recommend a professionally produced set. They’re better quality, end of. There are also rubber ones that look a bit like a wine bottle stopper – these are reusable but not actually that good at keeping wine fresh. Truth be told, I’ve not met anyone who wears those rubber ones on the bike. I can see how they would be useful at a motorsports event or the like. Personally speaking, I find them a bit uncomfortable, they’re always applying pressure to my ear canal, pushing outwards. They also poke out a bit too much and I can feel them being tweaked by my helmet lining when I’m riding. I’m all about the foam, me. When I was a yoof and first started riding, I was sensible enough to wear earplugs but I also had short arms and deep pockets. A set of disposable earplugs would last a month. In the end what I was stuffing into my ears was 50% earplug, 25% ear wax and 25% pocket fluff. Even though people always seem to link disposable earplugs with ear infections, despite my track record, I’ve never suffered one. Disposable earplugs are great – you can carry a few packets around with you and – unlike with custom earplugs – not worry about losing them. If you’re really cool, like me, you can fit an earplug dispenser like this one – https://amzn.to/2KvEXWa in your garage and that way you never forget to go out without a few pairs on you. There are hundreds of types around and I’d highly recommend you buy an assortment like these https://amzn.to/2KLhW0S and try them out to find a set that fits you best. As I hope I’ve made clear above, there is no ‘best’ when it comes to earplugs, because different plugs work in different ways for different people, so if you’re in any doubt, buy this earplug selection pack https://amzn.to/2KLhW0S and have a go yourself. In my time (almost a decade) of working as a motorcycle journalist, I’ve tried on tens of different makes and models of earplugs in the quest for the perfect one. The table below links to the Top 5 by rating on Amazon and I’m going to give you my personal opinion of them. I find these a bit itchy, the material isn’t that soft, and the slightly coarse material tends to get dirty quite quickly. They’re also harder to insert as they’re not conical and they’re quite short. Despite all this, they’re Amazon’s top rated, so what do I know?! Nice soft material and quite dense. They block out a lot of noise, too. These take a bit of a pro-touch to roll up and get in place before they expand – well at least that’s the case with my small ear canals.. Looking like a Rhubarb & Custard sweet but slightly easier to get in your ear, these Laser Lites are easy to roll up and fit, they have a good SNR rating of 35 (35dB reduction) and thanks to the soft foam, they’re comfortable too. Probably my second favourite model of earplug. You can’t go wrong with these earplugs from 3M but I don’t think they’re the best ones 3M do. These are called the 1100 range and claim to reduce noise by 37dB. They’re super cheap too. I can’t use these earplugs. They’re bigger than the rest, quite wide and consequently they need a deft touch to roll up and get in place. If you’ve got wide ear canals (mine are tiny), then these could be a good option for you but for me it feels like I’m trying to stuff a sock into my ear. These aren’t in the Amazon top five but out of the tens of pairs of earplugs I’ve tried over the years, these are my favourites. They’re soft, easy to roll and all-day comfortable. Despite being smaller in diameter, they have an SNR of 33, so they’re nice and quiet. 3M also do them in exciting (their words, not mine) flame graphics! The NRR rating is really confusing. Well it is to me at least. Let’s say the NRR is 23 decibels. You’d think this meant that it would reduce 100dB of noise to 77dB but it doesn’t work like that. Instead take the NRR number, subtract seven then divide by two (23 – 7 / 2 = 8), so a 100dB noise would be reduced to 92dB. Luckily, they also have the SNR, see below..
Slightly less confusing is the SNR – Single Noise Reduction. If an earplug has an SNR of 21 and the noise level is 100dB, then the earplugs would let an average of 79dB through. Give your disposables a longer life by using a squeeze pouch to store them in when you’re off the bike – rather than just putting them in your pocket. Sticking your earplugs in your helmet vents when you park up is a great way of getting an ear infection. Ask your custom moulded ear plug supplier to keep your moulds incase you want to order another pair. Earplugs are designed to cancel out high-frequency noise – like wind noise, so they don’t block out everything and don’t leave you feeling vulnerable on the bike. At first they take a bit of getting used to but once you get used to them you’ll wonder how you managed without. Can I wash foam earplugs? The short answer is no. If they get wet they tend to expand. Plus at 20p a pair, it’s not worth the hassle. Do they make bluetooth custom motorcycle earplugs? Can I hear my bluetooth headset with earplugs in? Sounds that are close by, like sound from speakers aren’t too badly affected by earplugs. Earplugs are great at cutting out high-frequency noise, like wind noise. You can get really good sound with a set of custom moulded earplugs with built-in speakers.